This paper argues that vestiges of Berlin and Inkster’s (1980) current-traditional rhetoric (CTR) paradigm still exists in some First-Year Writing (FYW) assignments that require students to write to an academic audience. I suggest that instructors use digital rhetoric as an analytic tool to critique these traditional writing assignments and to create and critically integrate multimodal assignments that disrupt the CTR paradigm. After briefly problematizing writing assignments that reflect CTR and the requirement that students write to an academic audience, I discuss my analysis and revision of a traditional argument-based FYW assignment. This analysis is supported by the inclusion of both the original and revised versions. Each version includes color-coded annotations to demonstrate areas in the traditional assignment that rely on CTR and to highlight modifications that embrace digital rhetoric in the revised multimodal assignment. I conclude by claiming the use of digital rhetoric as an analytical tool and pedagogical framework can help instructors create multimodal assignments that promote student agency, disrupt traditional academic writing conventions, and teach students how to effectively integrate rhetorical strategies to reach a real audience via online dissemination of the final text. Although multimodal composition assignments and the use of digital tools have become common in First-Year Writing (FYW) courses, many curriculums and assignments still require students to produce at least one traditional essay targeted to an academic audience using academic language. As a FYW instructor, I have witnessed students’ anxiety related to writing academically for college audiences; however, more recently, I believe this apprehension has grown. Possibly the proliferation of standardized high school writing curriculums and the continuous push for high school teachers to “teach to the test” have made writing academically even less relatable for incoming students than it has been in the past. High school writing assignments that require students to respond to prompts or follow a strict set of guidelines may not prepare students adequately to respond to collegiate writing situations that call for students to address an academic audience. College writing assignments that ask students to write to an “academic audience,” which reflects Ede and Lunsford (1984)’s “invoked” audience, may further compound students’ apprehension related to writing at the college level. Invoking an audience requires students to imagine and construct their audience, and can be difficult for emerging or even practiced writers. Even when writing instructors do provide students with a specific audience within a writing assignment, it is probable that this “audience” will likely be conceptualized by the student as his or her teacher. This “writing to the teacher” frame of mind often results in students guessing how to address their audience, which hinders their ability to write academically. Assignments that direct students to write to an imagined academic audience will most likely reflect current-traditional rhetoric (CTR) practices, which emphasize product, usage, style, and form (Berlin and Inkster 1980). When this emphasis becomes the basis for a writing assignment, it inhibits students’ creativity, promotes the binary of “good” or “bad” writing, and requires instructors to evaluate students on how well they can imitate traditional academic writing conventions. Though researchers and teachers have recognized that relying solely on CTR in writing assignments does not ensure, and may seriously hinder, students’ ability to recognize and converse with academic discourse communities (Werner 2017), remnants of or in some cases outright adherence to CTR still exist in many common FYW assignments. CTR is evident in assignments that require students to use proper MLA or APA documentation, correct grammar and mechanics, a regulated number of researched-based sources, and academic language. These types of assignments also generally rely on what Horner and Selfe (2013) call “single, uniform (‘standard’) language and modality” or SLMN, which results in a final product that has homogenized students’ language due to the required use of academic English and has been written using a word processor, printed, and handed to the teacher for evaluation. I suggest incorporating digital rhetoric as a conceptual composing framework (Eyman 2015; Zappen 2005) to problematize CTR practices, SLMN requirements, and a continued tradition of teaching students to write for an academic audience. Using digital rhetoric as a framework creates an environment for multimodal composition practices, which provide opportunities for students to engage with “real” audiences. Even though many writing instructors and programs have answered calls from the field (Yancey 2009) and integrated multimodal assignments into writing curriculums, they are sometimes treated as a less-than-important assignment compared to traditional writing assignments. While these assignments may be integrated to meet programmatic digital literacy requirements, multimodal assignments are often placed last in a sequence of assignments in writing curriculums and are often associated with a “fun” or motivating end of semester composition anomaly. While I am not suggesting that all multimodal assignments receive such curricular placement or act only to engage or motivate students (Takayoshi and Selfe 2007), I am urging more instructors to recognize that multimodal composing in digital environments is also a rigorous academic endeavor. This paper argues that using digital rhetoric to integrate multimodal composition assignments disrupts academic conventions perpetuated by the still prevalent CTR paradigm while also helping students write to real audiences, rather than the loosely imagined “academic audience.” I also discuss my use of digital rhetoric as an analytic method (Eyman 2015) to analyze a traditional assignment I have used in past FYW classrooms. Based on that analysis, I revised the assignment to embrace digital and multimodal affordances and disrupt academic writing conventions. As a FYW instructor at a four-year university located in an urban setting, I have encountered traditional writing assignments that rely on CTR and SLMN. These assignments are part of the writing program’s curricular focus on classical rhetorical concepts and traditional argumentative structures. This curriculum promotes academic rigor and opportunities for students to practice academic writing but it also reinforces teacher-centered pedagogy and rewards students who can follow the rules of academic writing. One assignment I found particularly problematic was the “Argument Without Sources Assignment,” even though I co-wrote the assignment sheet in 2013. The assignment is the first of four in a shared assignment sequence in the program’s College Writing II course, which focuses on information literacy and argumentative writing and likely parallels other writing assignments found in various FYW curriculums across the country. Knowing that I wanted to revise the traditional assignment, I first analyzed it using digital rhetoric and student-centered pedagogical philosophy. The result of my analysis is a color-coded visual analysis of the assignment (see Appendix A for the full assignment sheet) pointing out areas that adhere to CTR through language (blue) and content (yellow), requirements that perpetuate the production of SLMN texts (green), and sections that provide only vague references to audience (pink). In the following discussion, I have included screenshots of annotations made to the original visually annotated assignment sheet to support my argument that the assignment (and ones like it) still reinforce the CTR paradigm and the production of monomodal texts. The original “Argument Without Sources” assignment uses imperative language that promotes teacher-centeredness and decenters the agency of the student. Figure 1 shows that “must” is used five times and “will” is used twice in the span of five sentences. An overall authoritative tone maintains the feeling that a student cannot negotiate with academic conventions but should conform to the expectations of the teacher, program, or university. The relationship that this type of language use creates is also one based on authority rather than dialogue. The use of “must” solidifies the teacher as the giver of knowledge and the student remains the receiver. This problematic dichotomy may look shockingly familiar to many instructors. Even the assignment sheet’s formatting maintains that dichotomy. The font, font size, and spacing are severe and intimidating. Students literally “see” the authority of the instructor in the use of small margins and a lack of white space. The design does not take into account how a student might read it; rather its purpose is to identify requirements and rules. The design is unfriendly to transitioning writers and perpetuates the myth that “good” writing must look a certain way. 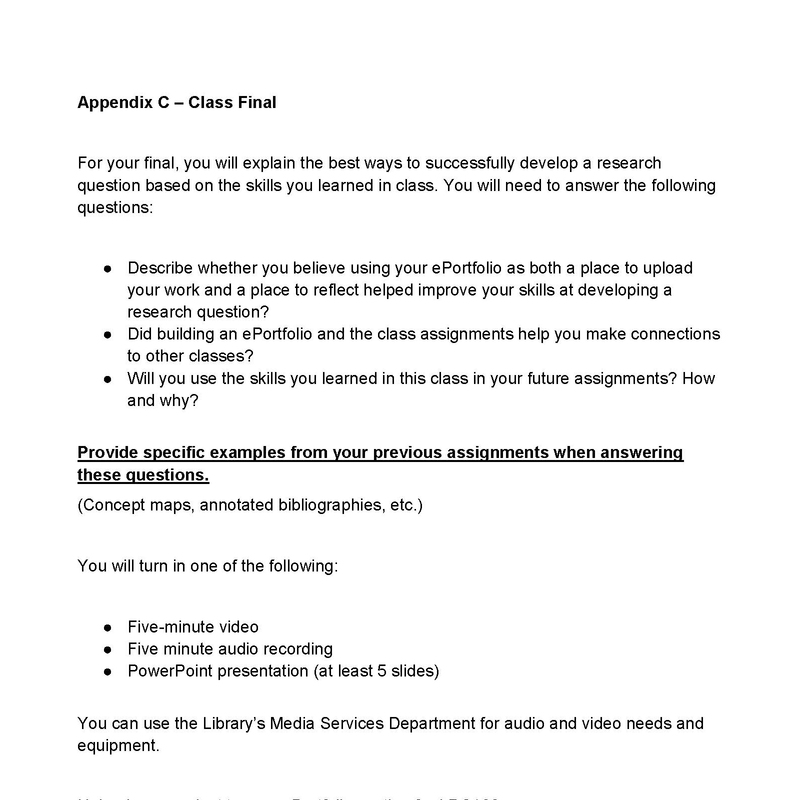 Please see Appendix A for the full assignment, and an accessible PDF file of the assignment. The green highlighted phrases in Figure 2 indicate that print-based design and dissemination is privileged. The “Evaluation” section declares that a successful text must have “correct formatting and MLA [and] a page length that is 2-3 pages.” Here, students are being explicitly asked to produce a print-based essay following the conventions of MLA style. Though I am not arguing for the removal of documentation requirements or the print-based essay, I do believe these stringent and non-contextualized requirements reduce students’ agency and increase focus on product rather than process. Perhaps if there was more emphasis on avoiding plagiarism rather than emphasizing the need to “correct” formatting and documentation, then students might begin to understand that a writer’s choice of documentation style signifies a connection with a discipline-specific audience. In the traditional assignment, the word “audience” is mentioned once and is only implicitly referred to later in the “Evaluation” section (see pink annotations in Appendix A). The assignment declares that students must “address an audience” using “ethos, pathos, and logos.” This statement does not allow students to clearly envision a real or easily construct an imagined audience and implies that they should simply write for the instructor. The lack of audience specificity adheres to the prevalent “teacher as audience” conceptualization of audience and does not disrupt the problematic nature associated with asking students to write academically. The “Evaluation” section also lists the use of “formal, academic language” as a requirement to produce a successful argument. Not only is this assessment criteria reinforcing CTR, but also some students may not have experience with this type of language or know when to use it. Further, if students do not have a concrete audience to address or if they cannot clearly imagine an audience based on their experiences, then asking them to use formal, academic language may prove especially frustrating for them. The last aspect of the assignment sheet, annotated in yellow, is a broader categorization of foregrounding teacher, program, or university expectations rather than the students’ own experiences and languages. Again, the “Evaluation” section states, “a successful argument will include all of the following requirements.” The focus here is on what students “must” include to complete the assignment and achieve a high score. There is little room for negotiation between the instructor and the student and clearly values the product rather than the process. Though there are references to process writing, specific points and due dates are also included taking away from the recursive nature of the writing process and revision. Figure 3 shows a list of specific features of argumentative writing (e.g. an introduction, body paragraphs, etc. ), which might be useful to new writers. However, the highly specific bullet points within each section seemingly imply that students should check provided argumentative features off the list as they write–possibly impeding their writing processes and promoting commonality among a diverse group of students. This promotion of commonality in writing also reinforces the problematic binary that there is a “right” way to write and only if a student performs as they are told, can he or she achieve success. While using this assignment in my courses, I quickly became frustrated because it forced students to produce essays that looked and sounded the same. The argumentative structures were repeated, student voices became homogenized, and, because students were forced to use their textbook as the basis for their arguments, the content was also very similar. After reading nearly 200 of these papers over the course of two academic years, I decided to begin embracing digital rhetoric and multimodal composing practices. Although there were challenges associated with integrating an assignment reflecting these practices and digital rhetoric, I argue that the revised assignment discussed below achieved the same course goals, encouraged creativity and agency, and taught students how to recognize and converse with various discourse communities. Using the same color coding method, I created a visual analysis of the revised assignment (see Appendix B). In this version, areas of negotiation and less imperative language are highlighted in blue, revisions to prescriptive requirements and teacher-centered pedagogy are annotated in yellow, integration of digital rhetoric is annotated in green, and specific references to audience are annotated in pink. The revision was implemented into my four sections of College Writing II in the spring of 2017. Like the original, students produce a persuasive text as the first assignment in the course sequence, but the revision asks students to choose one of their discourse communities (e.g. a video gamer community), determine an argument intended for that community, compose their text multimodally, and share it digitally with the community. When designing the assignment sheet, I attempted to make the format less intimidating and easier to read. I enlarged both the font size and spacing, which makes the text look less intimidating. I also used Calibri as a font, rather than Times New Roman, because it is not as commonly associated with traditional academic writing. However, I feel that the assignment sheet itself could (and should) be revised to include multiple modes rather than relying completely on changes to font, spacing, and white space. An additional “poster” from NCTE (2012) was included to provide an entry point for students beginning to learn about discourse communities and shows that disrupting traditional, scholarly formats is appropriate in context. Many students may feel that to “write academically” one must produce a text that looks academic. The NCTE text problematizes this notion and gives students a multimodal example of work created by a highly respected academic organization. The text can also serve as the basis for discussions about the relationship between context and design. For example, an instructor might facilitate a discussion about how to determine when a text should reflect academic design conventions and when a less traditional design might also be appropriate. In Figure 4, words highlighted in blue show the revision of declarative statements such as “students must” to more negotiated language such as “you should” or “this assignment asks you to…” I believe shifting from restrictive language provides students with the opportunity to reflect on, question, or negotiate with the assignment or the instructor rather than simply follow the directions. Please see Appendix B for the full assignment, and an accessible PDF file of the assignment. In Figure 5, the green highlighting points out instances where the assignment asks students to shift from traditional composing practices to multimodal and embrace the affordances of digital environments. The revised assignment requires students to compose multimodally and share their work online with the appropriate discourse community. Recognizing that not all students are comfortable with multimodal design, students have the choice to create more print-based texts such as posters or newsletters, but they are still asked to compose multimodally and share those texts with their discourse community online. This aspect of the assignment combines digital environments with traditional rhetoric, which allows students to account for their audience and medium when choosing appropriate rhetorical moves (Eyman 2015; Zappen 2005). This helps students think more about the power of visual, aural, gestural, and spatial modes of communication when constructing an argument as opposed to considering only the linguistic mode and print-based production options. When contrasting traditional print affordances and multimodal affordances, the latter provide students with more opportunities to communicate with varied and interactive audiences. Research has shown that students perceive audience awareness as an affordance of multimodal composing (Alexander, Powell, and Green 2012; Kirchoff and Cook 2016; Takayoshi and Selfe 2007). The revised assignment places audience awareness at the center of its pedagogical goal, rather than relying on a vague description of an imagined audience. Pink annotations showcase areas where audience is prioritized (see Appendix B for full annotations), beginning with the poster from NCTE that defines discourse communities and scaffolds understanding of discourse communities into the assignment. Figure 6 shows a disruption of the traditional notion of a teacher as audience by asking students to first visualize an imagined audience, based on their actual experience(s), then to write to those audiences by digitally sharing the texts with their communities. Shifting from vague audience conceptualizations to real and interactive ones aligns with two of the primary activities within a digital rhetoric framework: helping students form digital identities and building social communities (Zappen 2005). Asking students to share their work online embraces the affordances offered by writing in digital environments using digital tools (Nobles and Paganucci 2015). However, this choice was not without its challenges. Generally, students appreciated the opportunity to directly interact with an audience of their choice, but some students were not as comfortable with this component. Prior to the actual dissemination of their texts, some students requested that they be allowed to use fake names or to remove their work as soon as I had evaluated it. Students were quickly granted permission for their requests, but I recognize the gap in execution of the assignment. To account for this gap, I plan to scaffold lessons into the project that help students choose how they want to be (de)identified. I will also create an option for students to post their work to a shared and closed classroom website designed and curated by me. The revised assignment upholds the programmatic goal of requiring students to produce a persuasive text, but yellow annotations illustrate areas that allow for student creativity and playfulness. The “Evaluation” section, while still in a list form, has been shortened considerably and the criterion for success has been expanded. The revised assignment does not require “formal, academic voice”, which gives students more room to express themselves and use varied and rhetorically appropriate languages, dialects, and slang based on the discourse community they are addressing. However, the streamlined evaluation section creates a challenge related to creating an effective assessment tool. When assessing a student’s work, I need to act as both the evaluator and as hypothetical audience-member, which is challenging. Since the assignment was created to reinforce the components of digital rhetoric and allow for student creativity, I believe that my primary job is to act as a hypothetical audience-member and respond accordingly. Although this may put more pressure on the instructor, it helps shift the assessment of student work from evaluating how well a student demonstrates his or her ability to write academically (privileging commonality) to one that evaluates how well a student uses languages and various modes to effectively address his or her community (promoting difference). One potential benefit of the assignment is its ability to prepare students for responding to writing situations in other courses by not giving them a specific rhetorical situation. Instead, it urges them to really think about who they are as an author and as a member of that community, the message that they want to share within the context of that community, and to address a “real” community that they know from experience. This does not mean that some students do not choose to address a more formal community (e.g. a workplace manager) but it gives them the choice to do so. The point of this assignment is not to reinforce the importance of grammar, MLA, or academic voice (though those are important components of their final semester project) but to introduce them to the idea of discourse communities as audience and to think about composing in a digitalized world. When I incorporated the revised assignment into my course in spring 2017, I was nervous that students would push back against the lack of formalized instruction and that they might not see the connection between their discourse communities and writing persuasively. For the most part, I was happily surprised. I witnessed students who initially identified themselves as “terrible” writers spending hours on revising their website layout to “make it easier for my discourse community to understand.” One specific example stands out. A self-proclaimed “bad writer” from day one, Sue was hesitant about the class. When told that she would not be writing a formal essay as the first assignment, she became a little less hesitant. When told she could choose her audience, use language of that community, and share her message with them, she was absolutely thrilled. Two and half weeks later, she produced a website convincing a specific audience, the discourse community of avid golfers, to play at her favorite golf course. She included tabs echoing the traditional argumentative essay structure as well as an “author bio” tab, which she explained helped “get her credibility with her audience.” For the remainder of the semester, she was confident in her writing skills. She spent more time revising her traditional text than she had in other writing classes (according to her) and she became an active member in our small classroom community. The example I have shared is just one of many positive experiences I had with this assignment last semester, but that is not to say that there weren’t less-than-positive experiences. As stated previously, some students were uncomfortable with sharing their work online, while others struggled with the skills associated with creating a text using digital tools. Some students struggled to create functional websites and some had difficulties converting a text-based document into a format that could easily be shared online. While I attempted to account for these struggles via mini-technology lessons, more time should have been spent discussing problem-solving strategies to aid students in the creation and dissemination of their texts. These strategies might include prompting students to create a list of places to find help on campus and useful web-based tools (e.g. tutorials, freeware, examples, etc. ), which would be shared on our online course management system. Some students also felt that a multimodal composition assignment was not preparing them academically and disliked the non-traditional nature of the assignment. Yet, generally and anecdotally speaking, many students began to see that writing does not always have to look and sound the same and that there is room for creativity in academic writing. They also began to understand that “audience” does not simply mean writing to one’s teachers. This assignment also made it easier for me to introduce academic discourse communities to my students, which helped them think about a discipline-specific academic audience when they chose topics, journal articles, documentation styles, and language prior to and during the writing of their final research papers (a traditional, print-based assignment). My assertion is that framing a multimodal assignment using digital rhetoric helps teach students how to recognize the connection between audience, message, and digital environments. This kind of digital rhetorical work might also help shift the multimodal and digital assignment from “lesser than” to “equal to” or “as good as” traditional, print-based composing. My discussion here offers a revision of what I saw as a restrictive assignment that closely adhered to CTR. While I am not claiming that digital rhetoric and/or digital practices should replace traditional print-based composing practices, I am urging instructors to consider incorporating digital rhetoric into their curriculums to continue to provide opportunities for student choice and creativity. This paper showcased my willingness to use digital rhetoric as an analytic tool to analyze and then revise a common writing assignment in my FYW classroom. I also urge any instructor who wishes to push against the CTR paradigm of academic writing, which often leaves out varied and textured voices, to conduct a similar analysis of a traditional assignment and then revise it so it reflects a digital rhetoric framework. I hope that fellow instructors who have become frustrated with the vague instructional goal to teach students “audience awareness” will consider the affordances provided by digital spaces and help students learn (re)address real and interactive online communities. Eyman, Douglas. 2015. Digital Rhetoric: Theory, Method, Practice. Ann Harbor, MI: University of Michigan Press. Horner, Bruce and Cynthia L. Selfe. 2013. “Translinguality/Transmodality Relations: Snapshots from a Dialogue.” (Working Paper No. 7). Accessed November 10, 2017. http://louisville.edu/workingpapers/copy_of_working-papers. NCTE. (2012). Discourse community. Retrieved from http://www.ncte.org/library/NCTEFiles/Resources/Journals/CCC/0641-sep2012/CCC0641PosterDiscourse.pdf. Takayoshi, Pamela and Cynthia L. Selfe. 2007. “Thinking About Multimodality.” In Multimodal composition: Resources for teachers, edited by Cynthia L. Selfe, New York: Hampton Press, Inc.
Yancey, Kathleen Blake. 2009. Writing in the 21st century: A report from the National Council of Teachers of English. Accessed on November 10, 2017. http://www.ncte.org/library/NCTEFiles/Press/Yancey_final.pdf. Werner, L Courtney. 2017. “How Rhetoric and Composition Described and Defined New Media at the Start of the Twenty-First Century.” College Composition and Communication 68:4, 713-739. Zappen, P James. 2005. “Digital Rhetoric: Toward an Integrated Theory.” Technical Communication Quarterly 14:3, 319-325. This appendix is also available as a pdf. Melanie Gagich is an Associate College Lecturer in the First-Year Writing Program at Cleveland State University, where she has taught composition courses for six years. She is also currently pursuing her PhD in Composition and TESOL. Her research interests include multimodal composition, digital rhetoric, and open access resources (OERs). The following case study investigated the efficacy of Information Literacy (IL) pedagogy on undergraduate research in a credit-bearing library instruction class. More specifically, the study analyzed student success and sought to determine whether written reflection and practice strengthen IL skills, including the fundamental ability to develop a research question and thesis statement. Developing research questions and formulating thesis statements are among the most challenging duties of a young researcher. From high school through undergraduate, students often have minimal experience conducting research. They may not know where to begin the research process and what steps are necessary. Student frustration is exacerbated by the fact that typically IL instruction is one-shot guidance, given only once in a semester, making it difficult for a librarian to cover all that is needed. Can a semester long, credit-bearing course aid student success in research and improve IL skills? The instructors introduced several techniques to improve IL skills, and instructors evaluated three class assignments based on their college’s core competencies. Additionally, instructors collected and analyzed students’ written reflections of their progress and an end of semester survey as both qualitative and quantitative data. Information Literacy (IL) is one of the defining concepts of academic librarianship. It influences core functions including reference, collection development and especially library instruction. However, the definition of IL is malleable and influenced by the proliferation of online resources, developments in information technology, and trends in academic publishing, all of which have dramatically altered research methods. In January 2016, the Association of College and Research Libraries (ACRL), a division of the American Library Association (ALA), adopted the Framework for Information Literacy (Framework) for Higher Education. Its six core concepts afford librarians maximum flexibility when teaching IL (American Library Association 2015). This adoption was shortly followed by ACRL rescinding the Information Literacy Competency Standards for Higher Education (American Library Association 2000), which had served as the defining IL document for professional librarianship since 2000. The ACRL Framework defines IL as, “the set of integrated abilities encompassing the reflective discovery of information, the understanding of how information is produced and valued, and the use of information in creating new knowledge and participating ethically in communities of learning.” Moreover, the framework is based on interconnected core concepts with flexible options for implementation, rather than a set of prescriptive standards or learning outcomes. The Library Media Resources Center (hereafter Library) at LaGuardia Community College, part of the City University of New York (CUNY) founded in 1971, maintains an active and evolving IL program that impacts reference services, library instruction, and credit-bearing courses. The latter is exemplified by LRC103: Internet Research Strategies, a one-credit, liberal arts elective offered by the Library; it has been offered since 2004, and IL is central to the course’s syllabus (Keyes and Namei 2010, 29). The course teaches students “analytical thinking, problem-solving, and information literacy skills necessary for academic research and digital citizenship” (LaGuardia Community College Catalog 2017-2018). Students receive one hour of face-to-face instruction each week, covering concepts (concept mapping, research question development, citation) and resources (subscription databases, digital images, digitized primary sources) central to developing IL. While LaGuardia is not unique in offering a credit-bearing IL course, a 2016 study concluded that only 19% of higher education institutions surveyed offer such courses (Cohen et al. 2016, 566). Due to this small percentage, credit-bearing IL courses present a relatively unique opportunity to teach IL to students. This is particularly true when compared to traditional library instruction sessions, which are typically one hour long and offered once each semester for select courses (e.g. English 101). The following case study investigated the efficacy of IL pedagogy on undergraduate research in a section of LRC103 offered during the Spring 2017 semester at LaGuardia. More specifically, the study analyzed student success and sought to determine whether written reflection and practice strengthen IL skills, including the fundamental ability to develop a research question and thesis statement. In fact, the ACRL Framework recognizes the importance of research question advancement. As outlined in Research as Inquiry, research “depends upon asking increasingly complex or new questions whose answers in turn develop additional questions” (The Association of College and Research Libraries 2015). Developing research questions and formulating thesis statements are among the most challenging duties of a young researcher. From high school through undergraduate, students often have minimal experience conducting research. They may not know where to begin the research process and what steps are necessary (Fernando and Hulse-Killacky 2006, 103-104). Student frustration is exacerbated by the fact that typically IL instruction is one-shot guidance, given only once in a semester, making it difficult for a librarian to cover all that is needed. Can a semester long, credit-bearing course aid student success in research and improve IL skills? The instructors introduced several techniques to improve IL skills, and instructors evaluated three class assignments based on the college’s core competencies. Additionally, instructors collected and analyzed students’ written reflections of their progress and an end of semester survey as both qualitative and quantitative data. As a platform to post reflection, the authors implemented electronic portfolio (ePortfolio) practice for the course. 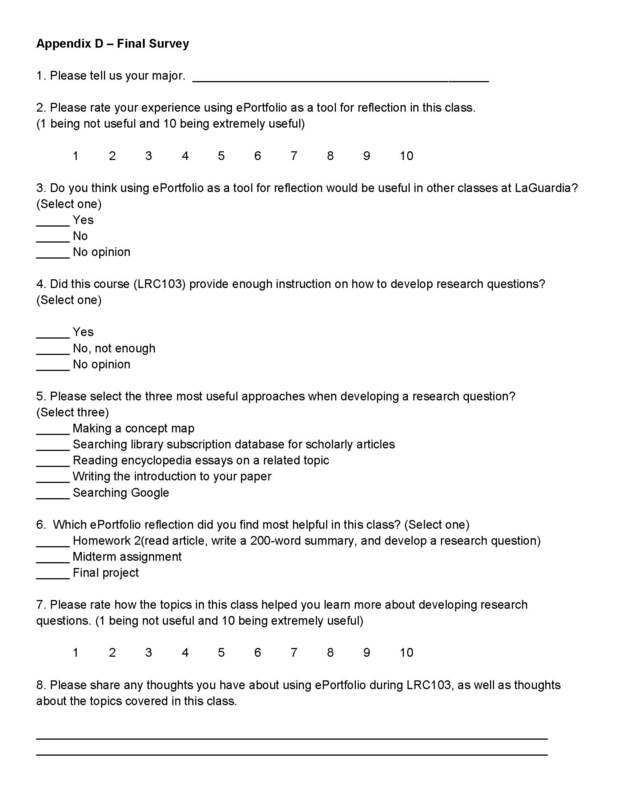 Deeply embedded in LaGuardia’s academic culture, its current ePortfolio program utilizes Digication software in both pedagogy and assessment (LaGuardia Community College, “About ePortfolio”, 2017). All twelve enrolled students were eligible to participate, and eleven elected to take part in the study. The following literature review reflects the goals of this study and is not intended to be comprehensive. Unlike conventional library instruction, the uniqueness of this study was that it examined students’ IL skills over the course of an entire semester. The research was empirical, using outcomes-based and affective analysis to study IL pedagogy. This case study expanded on the term project for LaGuardia’s LRC102, Information Strategies: Managing the Revolution, a credit-bearing course previously taught at LaGuardia, which called for an annotated bibliography, accompanied by a narrative of research where students describe the process used to find each item in the bibliography and explain its inclusion. In a study of LRC102, Fluk concluded that further research should be done into how research logs and journal writing affect student learning and how logs and journals should best be assigned (Fluk 2009, 50). Colleges and universities have targeted the following learning objectives when creating or redesigning credit-bearing IL courses: developing research topics research questions, and thesis statements (Mulherrin, Kelley, Fishman, Orr 2004, 24; Frank and MacDonald 2016, 17). Broadly considered, the literature on measuring and assessing the impact of IL instruction on educational outcomes is varied, especially in the wake of the 2015 adoption of the ACRL Framework, which omitted specific standards, competencies, and learning outcomes. Examples from community colleges and/or credit bearing IL courses were sought for this literature review. Longitudinal studies of students at Hostos Community College, a CUNY school with comparable demographics to LaGuardia’s, and Western Georgia University demonstrated that students taking IL workshops and a credit-bearing IL course, respectively, resulted in higher graduation rates, higher pass rates on reading and writing tests, and higher cumulative grade point averages. The Hostos Community College study results determined that students taking IL workshops experienced a 35.3% graduation rate, compared with 9.8% for students who did not take the workshops. Additionally, students who completed the IL workshop passed the CUNY Proficiency Exams for Reading at a rate of 78.5% and for Writing at a rate of 73.5%; the students who did not take the workshops passed the exams at a rate of 57.6% and 47.2% (Laskin and Zoe 2017, 13-16; Cook 2014, 276-279). Similarly, University of Western Georgia concluded that overall graduation rates for students in the study who completed their credit-bearing IL course graduated within six years at significantly higher rates than those who did not, 56% versus 30% (Cook 2014, 277-278). In their discussion of CUNY’s Critical Thinking Skills Initiative, Gashurov and Matsuuchi stressed the importance of IL for LaGuardia’s LRC103 course to ensure CUNY students are prepared for today’s competitive job market (Gashurov and Matsuuchi 2013, 70-71). The Critical Thinking Skills Initiative was in part a reaction to the financial crisis of 2007-2008, but LaGuardia’s commitment to IL can be traced back to 1991 when it began offering LRC102. As mentioned above, LRC103 was first offered in 2004 and is central to the Library’s IL program (Keyes and Namei 2013, 29). More recently, the Citation Project, a multi-institutional study on source usage in college writing, has concluded that students struggle with all aspects of citation and comprehending sources: summarizing, paraphrasing, and quotation, to name a few (Jamieson and Howard 2013, 125-126). Jamieson’s further research claims that IL pedagogy based on the ACRL Framework, more so than the older ACRL IL competencies, may help students better understand their sources (Jamieson 2017, 128-129), which matches the goals of the present study. At the postsecondary level, ePortfolio use has matured from a tool to document professional development to a web portal for accessing work, tracking academic growth, and planning a career, acting as a record of skills, achievements, and learning (LaGuardia Community College, “Introduction: What is an ePortfolio?”, 2017). Nevertheless, academic libraries have been slow implementing ePortfolios as compared to other campus departments, due in part because IL instruction is typically offered once per semester, in one class, and tailored to a specific assignment. However, a few have administered ePortfolios as a method of improving research and critical thinking. In 2008, Three Rivers Community College designed a plan whereby students searched for scholarly articles and then discussed the techniques used to retrieve them in a written reflection of their online learning experience posted into their ePortfolio (Florea 2008, 424-425). More recently, in collaboration with another campus department, the Otis College Library in 2014 created a research assignment that students uploaded to their ePortfolio and that instructors graded using the college’s core competencies (Giuntini and Venturini 2014, 11-15). Instructed by the authors, the LRC103 class in this study met weekly in one-hour face-to-face sessions for twelve weeks in the spring 2017 semester. Class lessons and assignments aimed to advance student research ability by fostering IL skills. The first class lesson introduced fundamental database tools, such as subject headings and subject term delimiters, to narrow a broad topic down to specific issues and subjects. The technique helps students comprehend article indexing and focuses student research to an elemental concept. For example, a search for “global warming” in a standard database yields thousands of results. However, the recommended subject headings “global warming & politics” and “global warming & the environment” generates a more manageable list. Subject term delimiters, custom to databases, refine this list to specifics. The assignment accompanying the lesson sought to discover if database tools support critical thinking development. First, it prompted students to write a 200-word description of an article found in a research database, summarizing the author’s viewpoint and any evidence provided in their argument. Next, it asked students to frame and develop a research question for further inquiry related to the article’s topic. Lastly, in a reflection, students explained if writing the summary helped them review and disseminate the material to forge a unique and specific area to research (See Appendix A). The second lesson demonstrated use of an online encyclopedia, illustrating the expansive subject list available. Then, students read an article on a select topic and gathered keywords. Students made note of words that they felt were key to understanding the topic. The final part of the lesson introduced concept maps, a graphical tool for organizing and representing knowledge. Concept maps break down a topic into related issues, with details or examples for each issue (Appalachian State University: Belk Library and Information Commons 2017). Words are usually “enclosed in circles or boxes of some type, and relationships between concepts [are] indicated by a connecting line linking two concepts” (Novak and Cañas 2008). Using the words marked in the encyclopedia article, students created concept maps. Following this lesson, students completed the second assignment, the class midterm, which asked them to develop a topic and their own argument using methods learned in class. Students had the option to use the first assignment topic or to select a new one. Suggestions provided were affordable housing, human trafficking, and junk food. The instructors recommended that students first break down the topic using a concept map and then develop a related viewpoint or argument from one issue or concept in the map. For the first part of the midterm, each student needed to find one scholarly article in support of their thesis argument and give a thirty-second, persuasive pitch in class to argue their viewpoint. 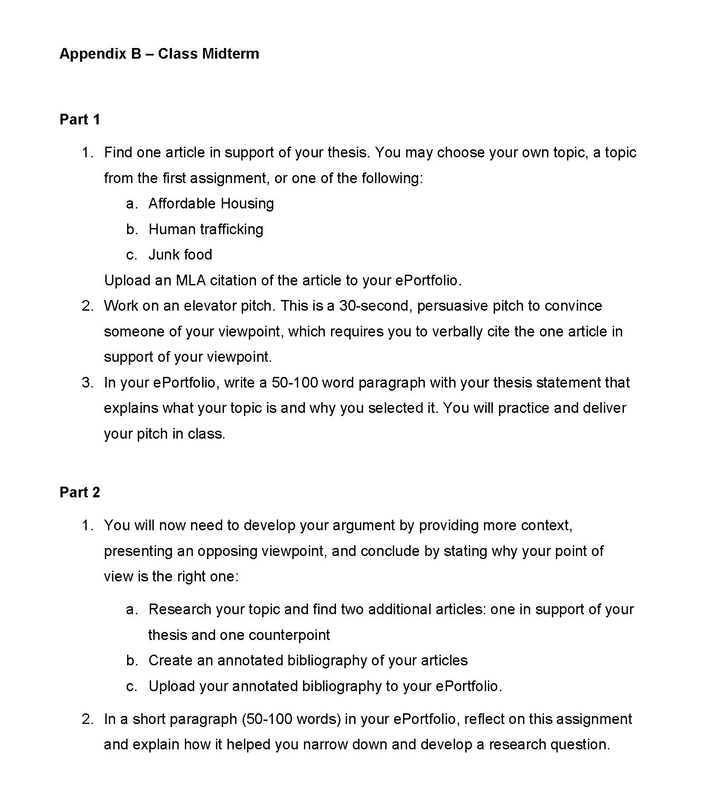 In their ePortfolio, they provided an MLA citation of the article and wrote a one-paragraph description, which included their thesis statement, an explanation of the topic, and the reason they selected it. In the second part of the midterm, students supported their arguments with two additional scholarly articles, one in support of their thesis and one counterpoint. To showcase their evidence, students created an annotated bibliography. For this class, an annotated bibliography referred to a list of resources, each with a reference citation in Modern Language Association (MLA) style and a summary or evaluation (Stacks, et al. 2017). Finally, in a one-paragraph reflection, students considered whether or not the lesson and midterm helped them narrow down their research and develop their arguments (See Appendix B). 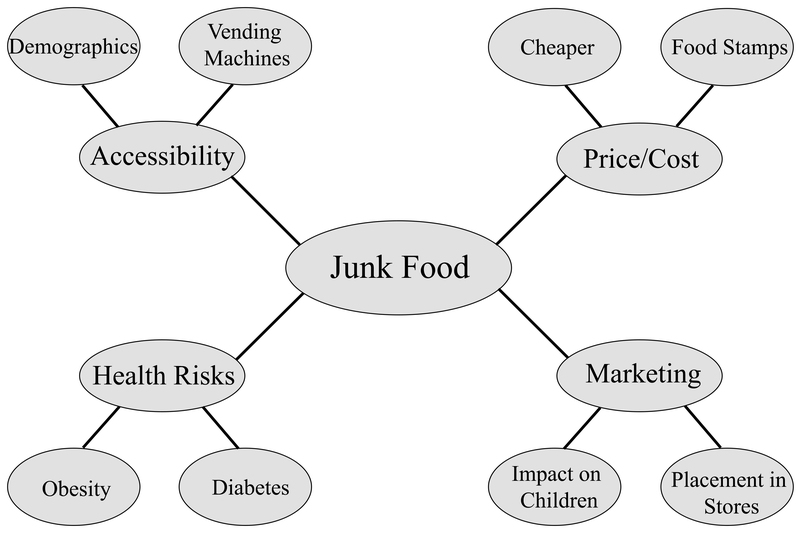 Figure 1: Sample concept map of ‘junk food’ and its related issues, complete with details and examples of each. Concept maps break down a topic or main idea into related issues or concepts, and onto details or examples. The class final required students to explain the most successful ways to develop a research question based on skills learned in class, in either a five-minute video, five-minute audio recording, or Microsoft PowerPoint presentation of at least five slides. As part of their work, they needed to describe if they will use the skills learned in other classes and assignments (See Appendix C). Lastly, an eight-question survey given to students on the last day of class provided a means to quantitatively measure success of class pedagogy. It was optional and anonymous (See Appendix D). To evaluate student work, the instructors created an assessment rubric based on one of LaGuardia’s four core competencies, inquiry and problem solving. Inquiry and problem solving is comprised of the ability to design, evaluate, and implement a strategy or strategies to answer an open-ended question or achieve a desired goal. Students advance this competency by framing an issue, gathering evidence, analyzing material, and formulating conclusions (LaGuardia Community College, “Outcomes Assessment”, 2017). Based on this framework, the instructors assessed student work on ability to: 1) analyze and synthesize research material, 2) formulate conclusions to develop research questions and thesis arguments, and 3) understand and integrate IL skills. Therefore, students who received a letter grade of A on an assignment demonstrated proficient IL skills. A letter grade of B signified competent skills, a C denoted developing skills, and a grade under C deemed the student a novice. In addition to a grade, the instructors also provided constructive feedback to advise students how they could improve their work. Since each of the three assignments weighed differently towards the student’s final grade, all grades in this article were proportioned based on one-hundred points. For example, if a student assignment received fifteen out of twenty points, the grade was seventy-five, or a C, and the student demonstrated developing IL skills. In addition to grades, the authors analyzed student reflections to draw conclusions on student progress in class and uncover what pedagogies best helped. In the first assignment, seven students demonstrated proficient skills, two had competent skills, one showed developing skills, and one was a novice, for a class average of 89.5. In a combined midterm grade, six students were proficient, three were competent, one was developing, and one was a novice, for a class average of 89.1. While student work remained at the competent stage in the first two assignments overall, performance improved to proficient on the final, for a class average of 96.7, as students displayed a deeper understanding of research concepts and were able to express them in presentation and reflection. 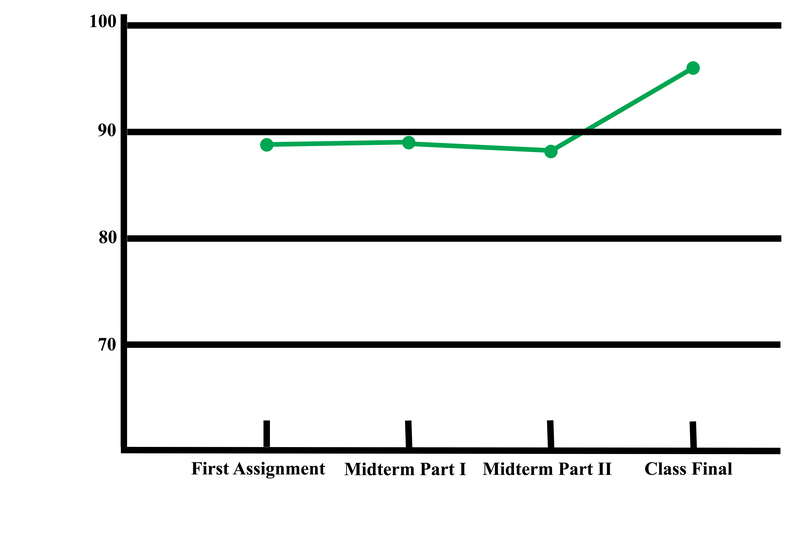 Figure 2: The line graph shows student progress in each of the four class assignments based on 100 points. 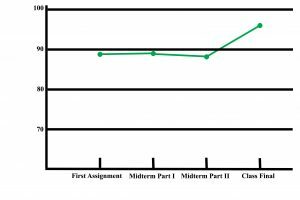 The class average changed from 89.5 in the first assignment, to 89.1 in the midterm, and to 96.7 in the final exam. Student obstacles in the first two assignments were inability to narrow down a topic in a focused research question and lack of solid arguments in thesis statements. For example, the research questions “are artists overly-hypocritical of other artists’ work for biased reasons?” and “is society to blame for engraving the idea that men were/are much more superior than women?” were not open-ended but rather took a position. Similarly, the question “what are the causes of animal extinction?” could be improved by selecting a specific animal or animal habitat. Conversely, the question “how did Edgar Allan Poe’s life affect his writing?” was open-ended and focused but could be revised by concentrating on one event in Poe’s life. 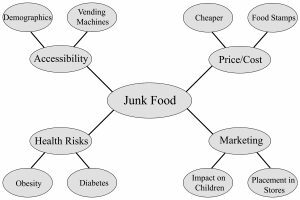 In the midterm, the statement “[weight gain and disease due to junk food intake] has been a problem that has been occurring for many years and there is a solution to the problem” was not a solid thesis but rather only stated there was a solution. On the other hand, the thesis “college students should get free tuition” suggested a solution but didn’t offer any justification. 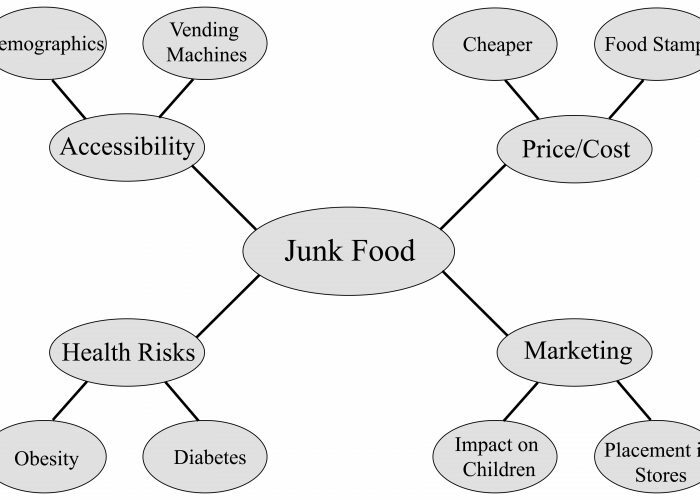 Lastly, the complete statement “due to the highly addictive nature of junk food and food manufacturers reluctance to alter their products or marketing, only some type of severe intervention will improve the quality of the food made in America and lessen the rates of obesity and diabetes” demonstrated a strong thesis and highlighted student learning progress, acknowledging the complexity of the issue while taking a side. Another student challenge was inability to follow directions. Some failed to provide an opposing viewpoint in the annotated bibliography while others placed too much opinion in a summary. For example, one student wrote: “[with this article] I came up with many more questions than answers.” Still, another student didn’t provide summaries at all, but rather simply listed citations. While most students explained class pedagogy well in the final exam, some didn’t explain it thoroughly enough or didn’t provide examples in relation to assignments. For example, one student simply added a bullet list on the final to support the best ways to successfully develop a research question rather than explaining them. Several students neglected to distinguish between their assignments, making it uncertain where one assignment ended and another began. This semester-long case study provides an argument that the course helped students develop IL skills and that further research is warranted. Its limitations were that it was conducted on one class with a low enrollment. The ideal case is either a class with a larger enrollment in a longitudinal study or a comparative study of two class sections, one section using reflection as a learning practice and one without. The authors hope their work can serve as a framework for subsequent studies at LaGuardia and elsewhere to foster IL skills. While grade success may suggest that students gained academic proficiency in the class, student reflection provides the best argument for credit-bearing IL courses. In their own words, students reflected how they integrated key concepts into their academic work that will be used in both future classes and in life. Students suggested the concept map as the key method to success in the course, making this graphical tool a vital part of library instruction. It allows students to break down a topic and make conclusions about what area to research. Reflections also provided an opportunity to connect class pedagogy to lifelong learning. In a final study feedback response, a student summarized the need for semester-long instruction, and that the course should have been one of the first classes that they took at LaGuardia to guide their research and IL skills. Student achievement in the course demonstrates that when applied in a credit-bearing IL course, strong IL pedagogy and effective use of instructional technology aids and enhances student success. Students generally felt that the IL skills they developed in LRC103 can be utilized in other courses. However, for IL instruction to be successful, strong pedagogy is tantamount in concert with thoughtful implementation of instructional technology, in this case ePortfolio. Ideally, credit-bearing IL instruction would be offered when a student begins college. The following is a list of considerations when making IL pedagogy decisions generally and possible next steps for LRC103. Nothing replaces solid pedagogy. Constructive assignments foster student learning. The lesson on concept maps as a method to develop focused research topics spurred the greatest jump in level of the inquiry and problem-solving competency. Assignments that encouraged metacognition — Student midterm reflections and answers in the final survey — also suggest concept maps as a useful method to help narrow a research topic. There is no ideal course management platform. An easy-to-use format where material and information can be added and retrieved is ideal. Naturally, the library may not be the final voice in what platform software a campus uses. However, it can suggest recommendations based on feedback from students. It is recommended that class time should be allotted at the beginning of the semester for course software instruction. Subsequent instruction should also be considered at the time assignments are introduced or prior to due dates, in order to model best practices. 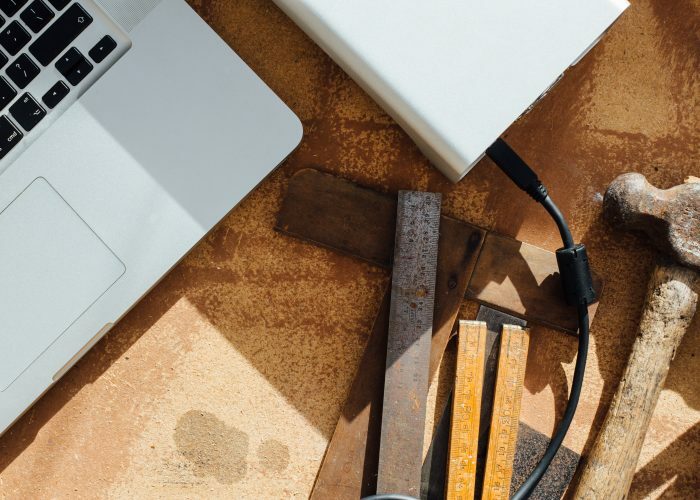 Finally, organization and maintenance of a platform is key to success, and, as with any electronic tool, ePortfolio is only as good as the effort put to its use. Things to avoid are unlabeled assignments, irrelevant material, uploads that require additional software, broken links, and incomplete evidence. Since LRC103 is a one-credit course with modest enrollment, the sample size will remain small thereby limiting the impact of quantitative data. Gathering more qualitative data in the form of written reflections and student interviews could benefit the ongoing development of IL pedagogy for librarians teaching this course. Regardless of the instructional technology utilized, student reflection and metacognition are essential for credit-bearing IL instruction courses. To promote library resources and services, collaborate with other departments. The English department is one option. Developing a research question, finding information, formulating a thesis, and then writing an argumentative paper are the basis for a common English class paper. Beyond English, there are ample opportunities incorporate IL pedagogy in various disciplines: history, social sciences, and STEM programs. An essential feature of the ACRL Framework is its flexibility. “Research as Inquiry,” “Information has Value,” and “Searching as Strategic Exploration,” three of the six frames, are central to academic research regardless of discipline. For example, LaGuardia’s Library has collaboratively developed a curriculum of one-hour, one-shot library instruction sessions for the college’s First Year Seminars, introductory, discipline-specific courses that provide remediation (LaGuardia Media Resource Center, FYS Library Instruction, 2017). The curriculum maps from LaGuardia’s core competencies (e.g. global learning, integrative learning) to related concepts in the ACRL Framework and library instruction lesson plans for each seminar; the entire curriculum is hosted on the LibGuides platform. This type of collaboration could be expanded to the Library’s credit-bearing courses to incorporate discipline-specific IL pedagogy. One way to incorporate is participation in LaGuardia’s Learning Communities, which pair two or more courses around a common theme (LaGuardia Community College, “Liberal Arts Learning Communities,” 2018). These learning communities could give LaGuardia librarians an opportunity to teach discipline-specific versions of LRC103 that would implement the conclusions from this case study and supporting research. American Association of Colleges and Universities. 2017. “High-Impact Educational Practices.” http://www.aacu.org/leap/hips. Appalachian State University: Belk Library and Information Commons. 2017. “Concept Mapping.” Accessed on October 9, 2017. https://library.appstate.edu/research-help-guides/video-tutorials/concept-mapping. The Association of College and Research Libraries. 2010. “Information Literacy Competency Standards for Higher Education.” Accessed on October 9, 2017. https://alair.ala.org/handle/11213/7668?show=full. The Association of College and Research Libraries. 2015. “Framework for Information Literacy for Higher Education.” Accessed on October 9, 2017. http://www.ala.org/acrl/standards/ilframework#introduction. Beagle, Donald. 2010. “The Emergent Information Commons: Philosophy, Models, and 21St Century Learning Paradigms.” Journal of Library Administration 50, no. 1: 7-26. Bryant, Lauren H. and Jessica R. Chittum. 2013. “ePortfolio Effectiveness: A(n Ill-Fated) Search for Empirical Support.” International Journal of ePortfolio 3, no. 2: 189-198. Clark, J. Elizabeth, and Bret Eynon. “E-portfolios at 2.0–Surveying the Field.” Peer Review 11, no. 1 (2009): 18-23. Cohen, Nadine, Liz Holdsworth, John M.Prechtel, Jill Newby, Yvonne Mery, Jeanne Pfander, and Laurie Eagleson. 2016. “A Survey of Information Literacy Credit Courses in US Academic Libraries.” Reference Services Review 44, no. 4: 564-582. Cook, Jean Marie. 2014. “A Library Credit Course and Student Success Rates: A Longitudinal Study.” College & Research Libraries, 75, no. 3: 272-283. Duvall, Sara, and Peter Pasque. 2013. “The 21st Century Literacies Gap: A Case for Adoption of the Student Learning Networks Model Grades 9-16.” Public Services Quarterly 9, no. 1: 70-80. Fernando, Delini M., and Diana Hulse-Killacky. 2006. “Getting to the Point: Using Research Meetings and the Inverted Triangle Visual to Develop a Dissertation Research Question.” Counselor Education & Supervision 46, no. 2 (December): 103-115. Florea, Mona. 2008. “Using WebCT, Wiki Spaces, and ePortfolios for Teaching and Building Information Literacy Skills.” Journal of Library Administration 48, no. 3-4: 411-430. Fluk, Louise. 2009. “The Narrative of Research as a Tool of Pedagogy and Assessment: A Literature Review.” In-Transit: The LaGuardia Journal on Teaching and Learning 4: 40-56. Frank, Emily and Amanda MacDonald. 2016. “Eyes Toward the Future: Framing For-credit Information Literacy Instruction.” Codex (2150-086X) 4, no. 4: 9-22. Giuntini, Parme and Jean-Marie Venturini. 2014. “Learning by Doing: Using Eportfolios for Assessment at Otis College of Art and Design.” Library Hi Tech News 31, no. 7 (August): 11-15. Guder, Christopher. 2013. “The Eportfolio: A Tool for Professional Development, Engagement, and Lifelong Learning.” Public Services Quarterly 9, no. 3 (July-September): 238-245. Hampe, Narelle, and Suzanne Lewis. 2013. “E-portfolios Support Continuing Professional Development for Librarians.” Australian Library Journal 62, no. 1: 3-14. Hsieh, Ting-Chu1, et al. 2015. “Longitudinal Test of Eportfolio Continuous Use: An Empirical Study on the Change of Students’ Beliefs.” Behaviour & Information Technology 34, no. 8 (August): 838-853. Jamieson, Sandra. 2017. “What the Citation Project Tells Us About Information Literacy in College Composition.” In Information Literacy: Research and Collaboration across Disciplines. Perspectives in Writing Series. Edited by Barbara D’Angelo, Sandra Jamieson, Barry Maid, & Janice R. Walker, 119-143. Fort Collins, Colorado: WAC Clearing House & University Press of Colorado, 2017. Jamieson, Sandra, and Rebecca Moore Howard. 2013. “Sentence-Mining: Uncovering the Amount of Reading and Reading Comprehension In College Writers’ Researched Writing” in The New Digital Scholar: Exploring and Enriching the Research and Writing Practices of NextGen Students. Edited by Randall McClure and James P. Purdy, 111-133. Medford, NJ: American Society for Information Science and Technology. Kehoe, Ashley and Michael Goudzwaard. 2015. “ePortfolios, Badges, and the Whole Digital Self: How Evidence-Based Learning Pedagogies and Technologies Can Support Integrative Learning and Identity Development.” Theory into Practice 54, no. 4: 343-351. Kuh, George and Carol Geary Schneider. 2008. High-Impact Educational Practices: What They Are, Who Has Access to Them, and Why They Matter. Washington, DC: American Association of Colleges and Universities. LaGuardia Community College. 2017. “About ePortfolio.” Accessed on October 9, 2017. http://www.eportfolio.lagcc.cuny.edu/about/. LaGuardia Community College. 2016. “Fast Facts.” http://www.laguardia.edu/About/Fast-Facts/. LaGuardia Community College. 2017. “Frequently Asked Question.” Accessed on October 9, 2017. http://www.laguardia.edu/ssm/faq. LaGuardia Community College. 2017. “Introduction: What is an ePortfolio?” Accessed on October 9, 2017. http://www.eportfolio.lagcc.cuny.edu/students/default.htm. LaGuardia Community College. 2018. “Liberal Arts Learning Communities.” Accessed on March 6, 2018. http://www.laguardia.edu/clusters/. LaGuardia Community College. 2017. “Outcomes Assessment.” Accessed on October 9, 2017. http://www.laguardia.edu/Assessment/Resources. LaGuardia Community College, Library Media Resources Center. 2017. “First Year Seminar Curriculum Map.” Accessed on March 6, 2018. http://guides.laguardia.edu/fys. Laskin, Miriam and Lucinda Zoe. 2017. “Information Literacy and Institutional Effectiveness: A Longitudinal Analysis of Performance Indicators of Student Success.” CUNY Academic Works. https://academicworks.cuny.edu/ho_pubs/60. Mulherrin, Elizabeth, Kimberly B. Kelley , Diane Fishman & Gloria J. Orr. 2004. “Information Literacy and the Distant Student.” Internet Reference Services Quarterly 9, no. 1-2: 21-36. Novak, Joseph D. and Alberto J. Cañas. 2008. “The Theory Underlying Concept Maps and How to Construct and Use Them.” Florida Institute for Human & Machine Cognition. Accessed on October 9, 2017. https://cmap.ihmc.us/docs/theory-of-concept-maps. Osborn, Jennifer. 2009. “E-Portfolios: Personal Learning, Professional Development.” Incite 30, no. 6: 18. Stacks, Geoff, et al. 2017. “Annotated Bibliographies.” Purdue Online Writing Lab. Accessed on October 9, 2017. https://owl.english.purdue.edu/owl/resource/614/01. Derek Stadler is the Web Services Librarian at CUNY LaGuardia Community College. Derek holds a B.S. in Computer Science, as well as an M.S. in Library Science and a M.A. in History. In addition to library research, Derek is also an avid history researcher, with a focus on New York City and urban studies. Ian McDermott is an Assistant Professor and Instruction Librarian at LaGuardia Community College, City University of New York. His teaching and research focuses on information literacy and open educational resources. He is particularly interested in exploring the intersection of information literacy and critical pedagogy. He received an MLIS from the University of Pittsburgh, an MA in Art History from Purchase College, SUNY, and a BFA in Photography from the University of Illinois, Urbana-Champaign. When describing students’ relation to digital technology, for the most part, educators employ the rhetorics of drugs and addiction without much hesitation. Students are considered hopelessly “hooked,” and in response to this state of affairs, many teachers adopt harsh in-class device use policies, along with attitudes of derision, anger, and fear, concomitant with the belief that technology is ruining young minds or even “deep” thinking as such. In response to such concerns, the following essay explores how one group of students—those in my upper-division Digital Writing course—described themselves and their relation to various media platforms. Students began by collecting a series of brief autoethnographic observations, which they then synthesized into blog posts which addressed the question “Am I Addicted to Technology?” Students were primed prior to writing by discussing an academic essay and watching a TED Talk that challenge employing the rhetoric of addiction/drugs, and when provided this alternative framework, many began to adopt it. 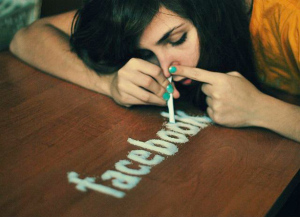 In-line with Hari’s supposition that “[t]he opposite of addiction is not sobriety[;] the opposite of addiction is connection,” students continually highlighted the importance of connection in their lives, without automatically stigmatizing this need by couching it in pathological terms. Some continued to describe themselves as addicts, but those who began to explore alternative vocabularies suggest analyzing student/teacher behavior in relation to technology in a variety of new ways. The more digital studies/digital humanities has increasingly become the focus of my teaching and research over the past few years, the more I am convinced there is something deeply problematic about deploying the figures of addiction and drugs in relation to technology. 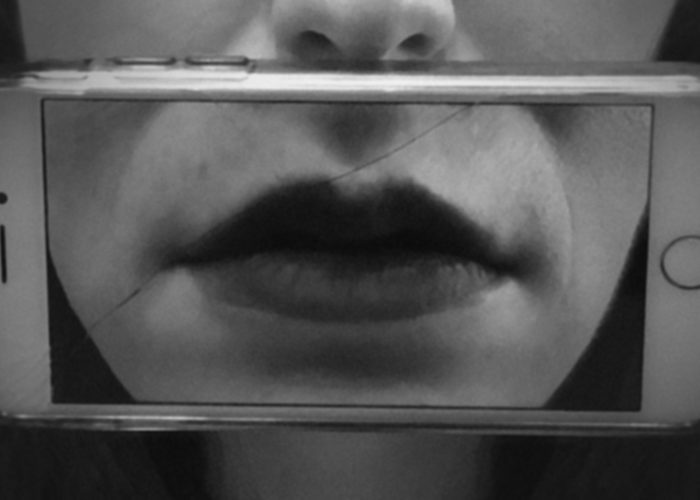 In a recent article published in the journal Enculturation, “This Fragile Machine: Technology, Vulnerability, and the Rhetoric(s) of Addiction,” I outlined my concerns in some detail, but this analysis was based primarily in rhetorical theory with little discussion of the pedagogical ramifications of the argument. What follows here, then, is an attempt to articulate how my previous contentions might affect classroom attitudes and practices, so as to prevent teachers and students from unwittingly importing the draconian logic of the War on Drugs into the classroom, in particular, with regard to digital device usage. My outline for investigating the above questions and concerns is as follows: I begin by briefly considering the prevailing attitude toward classroom technologies, wherein they are viewed as addictive substances, brain-damaging “drugs” upon which students (and certain teachers) are irrepressibly “hooked.” I then articulate my reservations with rhetorically framing technology in this way, while looking at how students in my upper-division Digital Writing course responded in academic blog-form to the question “Am I addicted to technology?” They were primed for this assignment by reading and discussing my Enculturation essay, along with watching a TED Talk by Johann Hari titled “Everything You Think You Know About Addiction is Wrong.” As I share these materials along with my own arguments, from the outset I will strive to articulate what pedagogical implications may be at stake if one were persuaded by them. At the same time students were considering the question of technology addiction, they were tasked with collecting autoethnographic observations on their social/digital media behaviors (something Margaret “Peg” Syverson inspired me to do after introducing me to the qualitative assessment tool Learning Record Online). Throughout, I share some of the students’ most interesting field-notes in the form of textual interjections, and suggest how one might evaluate them according to different rhetorical frameworks. Sharing this quasi-anthropological data, information which attempts to be as “neutral” as possible, is especially valuable because it evinces how students can be legitimate co-producers of knowledge, and are not bound by the reductive characterizations of their media practices many foist upon them. Indeed, through this assignment many students came to see how “drugs” and “addiction,” when applied to technology, are bound to specific rhetoric and not obvious clinical or psychological facts. Finally, I share some insightful remarks from students’ blog-posts on technology addiction, and speculate on how they might lead educators to transform their attitudes/positions and pedagogical practices. I hope that sharing these findings serves as a launching pad for further discussion and debate. What’s Wrong with the Rhetoric of Addiction? Following Small’s line of thought, scores of materials have been produced in recent years decrying a new cultural epidemic, where digitization is framed as outright dangerous, even capable of, in Nicholas Carr’s words, “threathen[ing] the depth and distinctiveness of the self … [along with] the depth and distinctiveness of the culture we all share” (196). Works like Carr’s The Shallows, and others in its genre like Mark Bauerlein’s The Dumbest Generation, Nicholas Kardaras’ Glow Kids, and Damon Zaharides’ Digital Detox (the latter two of which have the term “addiction” in their subtitles), however alarmist they may be, have struck a chord and met with incredible commercial success. A quick Google search for “technology addiction” and “cell phone addiction” collectively result in nearly one hundred forty million hits, with hundreds of articles from sources ranging across the entire political news spectrum. The medical community has gotten increasingly involved in the discussion as well, for instance, via debates over whether “Internet Addiction” is a medical disorder worthy of inclusion in the Diagnostic and Statistical Manual of Mental Disorders, Fifth Edition (Pies). And countries like South Korea have already declared “a public health crisis,” instituting programs to develop healthier tech-use habits for students of all ages (Digital Nation). By no means am I outright naively rejecting the claims of those concerned with digitization’s problematic affects/effects, but I do want to rigorously interrogate how such worries are troped or figured. I imagine most people, scholars included, because they have no alternative rhetoric for framing this example, would think it obvious that a student worried about checking their phone while in the Emergency Room is an “addict,” with all the troubling conceptual baggage attached to the term. As will become increasingly clear, however, what if one were to focus here instead on the irrepressible need for connection or bonding, especially in a frightening or painful situation? Provided observations like the above, it would be folly to ignore that sometimes classroom technology produces undesirable effects like distraction and detrimental cognitive modification, but ascribing identities can rob students of the opportunity to learn classroom-appropriate practices and to take responsibility for employing them. This is likely what Shelley Rodrigo has in mind when she contends: “[s]tarting with what the students already do works not only because we are going with the flow; … it is because it is going with their flow.” And it is not only a matter of going “with” the flow, but guiding that flow in an effective, insightful manner, versus, say, the above physics classroom, where it seems the problem is not addiction, but boredom, disengagement, disconnection, and ineffective pedagogy. (2) Even if one views addiction as the cyclical or algorithmic repetition at the heart of all behavior, the rhetoric of drugs is saturated with innumerable “moral” norms and prohibitions; hence one will likely feel ashamed or guilty if one cannot abstain. Scholars influenced by deconstruction such as Avital Ronell have suggested the stigma surrounding addiction might be lifted by seeing it as tied not to specific habits but rather all behavior. (More precisely, addiction is viewed here as an existential structure.) However, since the rhetoric of drugs/addiction is so tropologically loaded, I have difficulty accepting this approach will alleviate the “bad conscience” of students, absolving them of the guilt or shame they feel for “using.” After all, this approach still suggests tech-users are addicts, even if it moves away from viewing addiction as something attributable to the weak-willed. In fact, the universalization of addiction might even exacerbate the problem at issue. (3) In contrast to specific technologically-oriented behaviors, vulnerability/“openness” to affection by technology is inescapable. A posthuman approach highlights this exposedness, and thus challenges assumptions regarding identity, will, abstinence, guilt, and more. Although students seemed intrigued by my own claims regarding the rhetoric of technology addiction, it was clear from their blog-posts they were persuaded most deeply by Johann Hari’s TED Talk on addiction writ large. For one, Hari challenges whether the rhetoric of addiction is viable at all, suggesting “maybe we shouldn’t even call it addiction. Maybe we should call it bonding. Human beings have a natural and innate need to bond, and when we’re happy and healthy, we’ll bond and connect with each other, but if you can’t do that … you will bond with something that will give you some sense of relief.” The language of “bonding” that evokes the psychoanalytic concept of libidinal ties, not only helps diminish the stigma attached to addiction, it suggests students are driven to use technology—social media platforms in particular—not because they’re trying to evade reality or are looking for a dopamine fix, but because they’re simply doing what human beings are built to do: Connect. In contrast to his progressive insights, however, one move Hari makes that gives me pause is he avers digital connections are “like a kind of parody of human connection. [Since if] you have a crisis in your life, you’ll notice … it won’t be your Twitter followers who come to sit with you. It won’t be your Facebook friends who help you turn it around.” Rather than considering digital connections unfulfilling “parodies,” I think it far less problematic to highlight the various affordances in connection across different mediums. For example, face-to-face connection provides the affordances of physical touch, eye-contact, smell, “chemistry,” and so on, whereas online connection provides the affordances of multimodal interaction that surpasses speech/graphical writing along with extending connection beyond one’s geographic and temporal proximity. In other words, one can posit the importance of face-to-face connections without suggesting said connections are somehow more “authentic” than digital ones. As twenty-first century educators, helping students to navigate and balance relationship-types and their specific affordances is key, and it’s far more troublesome than helpful to suggest certain forms of desire for connection are addiction-oriented whereas others are not. Provided this example, again the rhetoric of drugs/addiction threatens to return. But what if one asked instead: Why does the student not view doing online research as itself collaborative? Is it because they’ve internalized the view that only face-to-face interaction counts as authentic engagement with others? And if the choice is between working with “strangers” in the classroom as opposed to “strangers” online–since most college classrooms don’t emphasize forming neighborly communities among peers–isn’t it less scary to engage with an “other” whose gaze one can escape? Put another way, it seems that because collaborative practices break with individualist, humanist models of education, one cannot assume students know how to work together collectively; hence one task of contemporary education is to help develop this indispensable skill. As I often joke with students: “It’s okay—we’re all still learning how to Internet.” And I mean that in relation to face-to-face networking as well as writing online, especially since robust team-oriented projects/evaluation are still an outlier in the humanities and learning to excel at and balance various types of connections with different affordances is something that is rarely, if ever, taught. Provided the above observations, then, there is great pedagogical significance in Hari’s concluding observation: “[I say] to the addicts in my life that I want to deepen the connection with them, to say to them, I love you whether you’re using or not. I love you, whatever state you’re in, and if you need me, I’ll come sit with you because I love you and I don’t want you to be alone or to feel alone.” As educators concerned with effective/affective bonding, isn’t this a vastly healthier message to provide students than to chastise or punish them for their so-called “addictive,” “weak-willed” behaviors? To sympathize with them for feeling caged? To make the analogy more explicit, if you’re a student “using” technology problematically in the classroom, I still love you; it’s apparent you’re not feeling loved or connected, so I’ll go out of my way to form a bond with you or encourage activities that lead you to bond with others, especially in contrast to the above punishment-oriented approach. In this regard, I think it’s obvious many classrooms are not emotionally sensitive spaces. To the contrary, they’re ultra-logocentric, implicitly presupposing education has nothing to do with pathos. As burgeoning pedagogues, we are rarely taught how to form healthy, meaningful connections with students, but in a society where people are lonelier and more isolated/alienated than ever, developing such connections seems increasingly exigent. Perhaps this is to suggest that concomitant with helping students/teachers became increasingly digitally literate, is a call to help them become more emotively reflexive and considerate of which types of connections are most fulfilling in which contexts and for what reasons. After being primed to question the rhetoric of drugs in relation to technology-use, what did students themselves have to say about digital “addiction,” and what might educators gain from these observations? For one, I hope it’s apparent that by valuing what students have to say about themselves, this highlights the importance of student/teacher co-invention of knowledge (and feeling!). Or as Kimberly Mair puts it, I see encouraging students to define their own relations to technology as “acknowledg[ing] the emergent shift from the expert paradigm of one-directional knowledge transfer to a collaborative model of knowledge production known as distributed expertise.” To cite and discuss the findings of students is not some mere research curiosity, but indicates a genuine desire to cultivate new frameworks for “seeing” technology in tandem with students themselves, especially since they often aren’t bogged down by traditional assumptions or vocabularies. When one is a non-millennial educated in a print-centric, humanist environment, it’s disrespectful and intellectually myopic to simply dismiss contemporary student attitudes and media practices with disdainful finger-wagging as though one Knows Better. Contrasting a more traditional, “bad conscience”-wracked response were students who tried to carve out a middle path, wherein they retained the rhetoric of addiction while questioning its accuracy, effects, and so on. One student, Cole Sanderson, posited “I think we are addicted to using social media and cell phones for communication but it’s not in a bad way. It just makes things get done more efficiently when communicating. … I don’t think addiction in this sense should be looked down upon because it [is] truly helping people communicate in a faster way” (emphases mine). This observation not only evinces having rejected the guilt/shame associated with technology-use, but suggests this sentiment is justified since such an “addiction” doesn’t involve breaking social norms. The question remains, however—in-line with concerns regarding addiction as a universal existential structure—can one truly deploy the rhetoric of addiction without it remaining contaminated, saturated by normativity? For as Jacques Derrida avers, “[a]s soon as one utters the word ‘drugs,’ even before any ‘addiction’[,] a prescriptive or normative ‘diction’ is already at work, performatively, whether one likes it or not” (229). In other words, perhaps the *only* way out here, ironically, is to abstain from the rhetoric of technology-as-drug(s) altogether, a move one student, Rachel McCown, seemed to be shifting toward. As she explains, “[s]ome people claim that you can be addicted to technology … I think I fall somewhere in the middle of these two arguments. I don’t know that I would call it an addiction because most everyday tasks require the internet or technology to some degree, but I do know that people experience an impulsive need to check their social media, blogging sites, and emails” (emphasis mine). I appreciate the distinction made here, as no one would deny people feel “vulnerable to” and compulsively drawn toward certain technologies; it’s simply a question of how one figures that impulse. Moreover, McCown’s observation about “everydayness” suggests asking one to imagine a historical classroom where print books had recently become available, and the instructor has become incensed at the student who loves text and can’t keep “his” nose out from between the pages, looking for information (rather than drawing on so-called “personal” memory). A behavior once chastised and stigmatized as breaking pedagogical norms, as proto-“addictive” (especially when someone like Madame Bovary, i.e., a woman), dared do it, is now looked upon by many with nostalgic longing. As opposed to “harmony,” however, many academics have developed and propagated an adversarial attitude toward technology, along with putative disciplinary measures, and have thereby unwittingly imported the logic of the War on Drugs into the classroom. Another student, Brianna Coggins, seems to sense as much when she writes “labeling urges to use a phone or computer as an addiction takes the situation out of context and blows it out of proportion to push an ‘anti-digital age’ propaganda caused by personal hesitation – fear of the effects the digital world has on humanity” (emphasis mine). Here, not only does the student’s observation resonate alongside previous ones with regard to eliding key differences between types of compulsive dependency, she spotlights how many over-generalize and transmute personal fears into apocalyptic universalizations about the degeneracy of contemporary culture. Yet, despite this mass panic regarding technology-use among certain populations, one bright student dared arrive at an almost diametrically-opposed position, namely, that “[p]eople think that social media is taking away human interaction and physical contact[, but] in fact, social media is just giving us a new way to define what it means to be a human. It isn’t the end of humanity, it’s a new beginning” (emphasis mine). Here Mountjoy recognizes—even if she doesn’t employ the exact vocabulary—what is at issue is the question of affordance. Digital media technologies produce opportunities for new forms of human interaction and bonding, such that what it means to be human is expanding rather than disintegrating. Such is the vision promoted by a posthumanist pedagogy and its accompanying classroom or lab: a space wherein the desire for connection and exploring/“balancing” affordances in bonding, whether via analog and/or digital modes, is not only encouraged and guided in emotionally-attuned fashion, it is viewed as an inescapable part of existing in relation to and through others—where it is recognized no “desiring-machine” functions on its own, independently of a network. Or to pose it as a question: what transformation takes place when one affirms that being irrepressibly drawn toward technology (or any “other”) is not indicative of failure to resist through resolute will, that is, to destructive “addiction,” but to the vulnerability of bodies affected by that which non-declinably grasps them? Although technology-use may derail one’s initial educational aims, as teachers and students, it is within our capacity to redefine and reframe the rhetoric involved, not only putting into question our aims themselves, but cleansing our teaching and learning more generally from derisive moral judgment and retributive discipline, thereby vitally, “mercifully,” modifying our pedagogical attitudes and practices. For questioning is the blasphemy which drives the motor of invention. In reference to my initial reservations regarding the rhetoric of addiction, I cannot encourage strongly enough that readers check out Eve K. Sedgwick’s challenging and incisive essay “Epidemics of the Will” in Tendencies. Question: What if one were to “legalize” all digital devices in classrooms, then take the substantial energy and resources spent on policing device (mis-)use and channel it into helping students form substantive connections? What might this look like, to respond to students not with punishment but by further facilitating connection? Near the end of her post, McCown adds “maybe calling it an addiction is wrong because it’s really people trying to stay active when life around them has become dull. There are always new things to read and do on the internet when you’re sitting in a boring lecture that you can’t listen to even if you try. In lectures and classrooms your attention is being forced to focus on things you’re not necessarily interested in” (emphasis mine). In Occupying Memory, I make a similar claim in relation to the rhetoric of trauma and “the traumatic,” namely, that even (and especially) scholars have a bad habit of throwing around the term, especially when it’s fairly clear they have never undergone being traumatized themselves. As an exemplar of this type of argument, I point the reader toward Nicholas Carr’s best-selling work The Shallows: What the Internet is Doing to Our Brains. Carr, Nicholas. 2011. The Shallows: What the Internet is Doing to Our Brains. New York: W.W. Norton & Company. Derrida, Jacques. 1995. “The Rhetoric of Drugs.” Points… Interviews, 1974-1994. Translated by Peggy Kamuf and others. Stanford: Stanford University Press. Hayles, N. Katherine. 2012. How We Think: Digital Media and Contemporary Technogenesis. Chicago: Chicago University Press. Ronell, Avital. 2004. Crack Wars: Literature, Addiction, Mania. Chicago: University of Illinois Press. Sedgwick, Eve K. 1993. “Epidemics of the Will.” Tendencies. Durham, Duke University Press.